This beautiful taupe pink colour is the trendy colour for this fall and winter season. The name ›Goal Digger‹ was given to inspire you to go for your dreams, make them your goals and make them your reality. Don’t let anyone ever tell you, your dreams are not achievable. Pretty crazy things have been evented in this world which nobody thought would ever be possible so no matter how crazy the thing is that you want, start making all your decisions and putting all your effort into making that become a reality. It can happen! And it will. ›Goal Digger‹ can also be found in the nail polish trio ›Chasing Dreams‹. For best results, we recommend to first apply our vegan base coat, then 2-3 coats of nail polish and finish off with our vegan top coat. 1-2 days a week it is good to give your nails a little break and some fresh air. Once your nail polish is empty, remember to recycle it. Learn how to recycle it here. Our goal was to create the perfect harmony between quality and natural with any of our products. All our products are vegan and cruelty-free, proudly registered by the ›Vegan Society‹ and ›PETA‹. Our products are also 14 toxin-free which means we do not include the following commonly used more toxic ingredients in our nail polish: Phtalates (incl. Dibutylphthalate (DBP), Diethylhexyl Phthalate (DEHP)), Toluene (also Methylbenzene), Xylene, Camphor, Formaldehyde, Formaldehyde Resin, Ethyltosylamide, Triphenylphostphate, Colophoneum, Organic Halides (AOX), Parabens, Silicone, Fragrances, Animal Derived Ingredients. All our nail polishes are of great quality, giving vibrant colours from just the first stroke and lasting up to seven days. At Kia-Charlotta we love animals. We live a vegan lifestyle which means, for us it is top priority that all our products are also 100% vegan. All products are formulated without the use of any animal derived ingredients and none of the products have been tested on animals. We are proud to have our whole range registered by the ›The Vegan Society‹ as well as by ›PETA‹. All Kia-Charlotta nail polishes are formulated without 14 of the most toxic ingredients commonly found in nail polish: Phtalates (incl. Dibutylphthalate (DBP), Diethylhexyl Phthalate (DEHP)), Toluene (also Methylbenzene), Xylene, Camphor, Formaldehyde, Formaldehyde Resin, Ethyltosylamide, Triphenylphostphate, Colophoneum, Organic Halides (AOX), Parabens, Silicone, Fragrances, Animal Derived Ingredients. Whilst we stay away from the most toxic ingredients, animal testing and animal derived ingredients we promise you the quality of our nail polish has not suffered. In fact, we believe that the quality is even better. Not only are the nail polishes long lasting and high coverage, they also do minimum harm to the environment, animals and people. For is it was important to ensure that all our products are made in the EU ensuring fair working conditions for everyone within the supply chain. All our products are made in Germany. We at Kia-Charlotta strive to create a brand that brings you joy whilst also doing minimum harm to our planet. 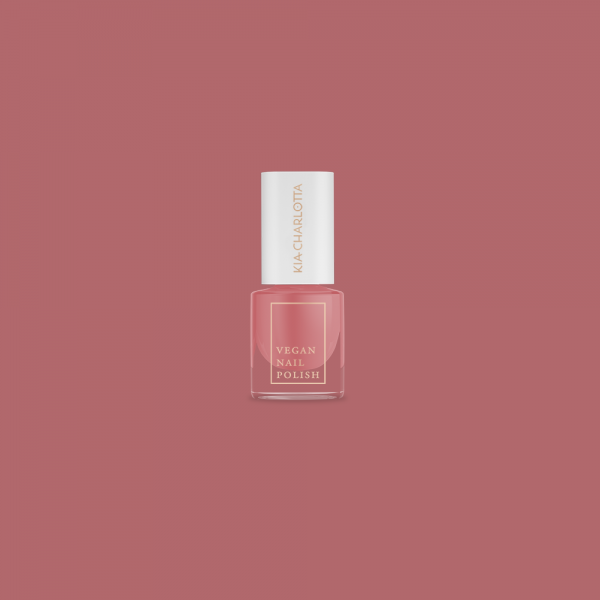 This can be seen throughout our product development including the size of the bottle, naming and stories as well as the formula of the nail polish. We like to encourage our customers to buy a 3 nail polish set package which we have created, which resonates with them the most or from which they like the colours the most. The packages include complimenting colours, from which everybody will find a favourite. One package will last you a whole season after which your bottles are empty and recycled and we have a new set of colours and inspiration waiting for you. All our nail polishes are also sold separately for those who wish to have even less (or more) or create their own combinations. Subscribe to our free newsletter and don't miss any of our offers or news.